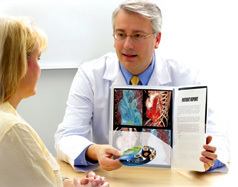 Codonics CD and DVD media meet the demands of today's medical imaging storage requirements. Featuring disc-to-disc consistency, long-term data archival, and a tough recording surface that guards against dirt, moisture, scratches and fingerprints, our disc media offers industry-leading quality. Codonics CDs and DVDs record and print at impressive speeds. Large CT and MRI studies are easily stored on a single Codonics 4.7GB DVD with an outstanding 18X recording time, while smaller studies are ideal for Codonics 700MB CDs with a rapid recording speed of 40X. Codonics offers low-cost standard print or premium print surfaces for stunning color labels using ink that's virtually dry the instant the disc is finished. 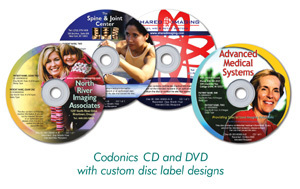 The Codonics Virtua® Medical Disc Publisher is designed to record hundreds of CDs and/or DVDs a day and generates IHE PDI compliant discs. To keep pace with the workflow, our disc publisher offloads recording from the modality and PACS workstations so that patients can be processed without any interruption. Codonics offers a disc design service exclusively for our customers that creates full color corporate disc labels to market your practice. Let us help you create the look that will give you a marketing edge, making you stand out from your competition. Codonics Virtua features a world-class interface with an intuitive touch screen that allows novices to become experts in minutes. 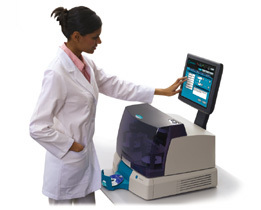 * Contact your Codonics representative for model configurations and media availability. Specifications are subject to change without notice. Contact your Codonics representative for the latest information.